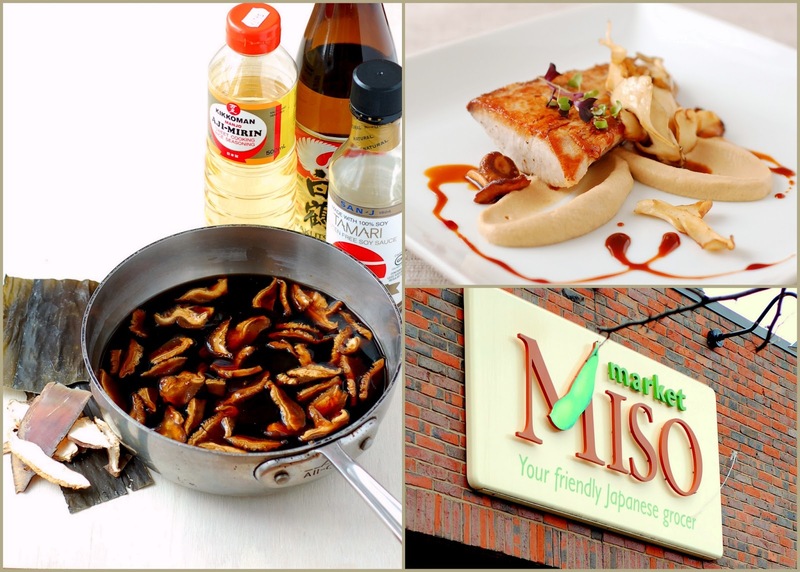 Sept 24 update: It is with great sadness that I have to report the closure of Miso Market. Hiroshi Minato is an avid cook who moved to Boston from Japan. He took one of my cooking classes when I used to teach in Cambridge. I haven’t seen him for years until this fall when he came to one of the gatherings I organised for my students at the Catalyst bar. When I saw the enthusiasm with which he was talking about Japanese cuisine, I got an idea. “Hiroshi, can you give me a tour of H-Mart?” I asked. Extorting food related information from innocent people is my specialty. Hiroshi said “yes,” and we scheduled a shopping trip. We met at H-Mart, a behemoth of a store, with his friend Mina and started exploring. Having a Japanese native and a Korean native (Mina is Korean) with me was essential. Not that I couldn't buy a few products I was familiar with by myself, but I would never be able to choose new products to try without some guidance. “You should go to Miso Market in Porter Square,” Mina said as we were faced with the endless selection of products and no one around to help us. “People there actually answer questions.” I took her advice and a few weeks later went to Cambridge in search of a better shopping experience than H-Mart. After that first trip, I was hooked and Miso is now my destination of choice for all things Japanese. Miso Market is a little engine that could. Don’t let its diminutive size fool you. H-Mart carries a ton of products, but only a small fraction of them are Japanese. Almost all Miso products are Japanese, so the variety it offers is not far behind H-Mart. But the point is not whether they have 12 types of kombu or 6. The point is whether their staff can help you find what you are looking for, or help you try a new product. At H-Mart, you are lucky if the staff can point you to the rice aisle. At Miso Market, the staff knows both Japanese cuisine and English language exceptionally well and everyone I met was willing to answer my endless questions. If you have no idea what to get at Miso, here is my usual shopping list. Katsuo-Bushi (bonito flakes) -- thin fluffy shavings of bonito (tuna’s little cousin) used to make dashi. Wakame -- seaweed used in salads and miso soup. No cooking required. Just put it in warm water or soup for 10 minutes and watch it expand. Hijiki -- flavorful and toothsome black seaweed. Here is a recipe for hijiki braised with carrots. Nori -- thin roasted seaweed used to make maki rolls, and hand rolls. They have a big variety with different crispness levels. It’s usually indicated on the package as 1, 2, 3. Choose less crispy (1 or 2) for maki rolls and very crispy (3) for hand rolls. Soy Sauce -- They offer organic and gluten-free options. Out of the ones I’ve tried so far, Kikkoman Extra Fancy Whole Beans soy sauce is my favorite, but for classes I usually buy Gluten-free reduced sodium Tamari in case someone has a gluten allergy. Sashimi Soy Sauce -- a little bottle with the picture of raw fish. worth buying if you make sushi at home. Shiso leaves -- in the summer I grow my own (it grows like a weed and even my gardening incompetence can’t kill it), but the rest of the year I get them at Miso market. Shiso is very aromatic and refreshing, somewhat similar to mint. Rice -- I usually get either Tamanishiki or Matsuri brands. Pocky -- maybe you have the willpower to leave a Japanese market without Pocky, but I don’t. Besides, my kids would not be happy if I returned home without those chocolate covered sticks. Noodles -- what a difference good soba makes! Soba from Whole Foods tastes like noodle shaped cardboard to me, but the stuff from Miso market is great. I prefer soba with 80% buckwheat. They also have udon, ramen, etc. Miso -- I usually look for miso without dashi or other additives. If you are new to miso, try Shiro (white miso). There are endless uses for miso, but here are a few to get you started. You can add it to soups, stir it into mayo with a bit of lime juice for a killer dip, and use it to marinate fish and other proteins. Dry Shiitake -- dry mushrooms give soups and sauces fabulous depth. For Italian cuisine, I use porcini, and for Japanese shiitake. To get your feet wet with Japanese cuisine and put your goodies from Miso Market to good use, try making soy concentrate. It’s the demi-glace of Japanese cuisine. To call it an “umami bomb” would be an understatement. It’s an umami weapon of mass destruction. If I had to have one sauce in my fridge at all times, I’d choose this sauce over demi-glace. It tastes great on everything from fish to vanilla ice-cream. Don’t look at me like that. Have you never heard of salty caramel? Well, this is better. The good news is that it takes about 15 minutes of active time and lasts in the fridge forever, so unlike demi-glace, it’s also convenient. You can get everything you need for this sauce at Miso market except for Sake. Go to a wine store (may I suggest Wine and Cheese cask in Somerville?) and ask them for affordable sake that you can use for cooking. I buy it there for about $12. The thick shavings of bonito you see in the picture are sadly not available in the US (or at least very hard to find) and I am almost out of the bag I brought from Tokyo. The recipe below assumes you’ll be using thin bonito flakes which should be added in the end. If you get your hands on some thick bonito shavings, add them to the liquid to soak from the very beginning with all the other ingredients. In a small saucepan, combine everything together except for katsuo-bushi (unless you are using atsu kezuri, in which case, add it right in). Let sit for 1 to 12 hours at room temperature. Bring to a boil on the stove top and regulate heat so that the mixture bubbles, but doesn’t bubble out of the pot (watch out, this sauce gets foamy, so don’t leave it unattended). Simmer until syrupy and reduced to your liking. * Take off heat. If using katsuo-bushi, stir them into the sauce and let sit for 3 minutes. Strain the sauce through a fine mesh strainer forcing it through with the back of a ladle. Cool until barely warm and move to a jar or squeeze bottle. When the sauce cools completely, cover tightly and store in the fridge. This sauce doesn’t spoil, but is best if used within 3 months. *Judging doneness with this sauce is tricky. Luckily, it will still be good whether you make it thicker or thinner. After you make it a few times, you’ll develop your own preference for how thick and syrupy you like it. I like mine very thick (after refrigeration, I want it to feel like molasses) and this recipe only yields about 2/3 cup sauce for me. You might like yours thinner. The thicker you like it, the harder it is to push the sauce through the paper towel, so you might want to reduce it only in half, add katsuo-bushi, strain, then return the sauce to a clean saucepan and continue to reduce it. Keep in mind that the sauce becomes a lot thicker as it cools. To help you make a guess about its texture as it cooks, put a few drops on a cold plate and wait a few minutes. Touch the drops with your finger to see how they feel. You are aiming for the consistency of maple syrup. Last night discovered my toaster oven on convection mode w/the door slightly open could dry fresh shiitakes (and now I know, anything!) I am marinating a tuna steak following this: http://www.helenrennie.com/recipes/fish/grilled_tuna.html (I am missing the teriyaki and am using dried garlic & ginger). Really excited to try this delicious treat!! Now if only I could figure out the veggie component... Am thinking baby potatoes and some roasted broccoli. Once again, always thank you for the inspiration. Can't wait to make the green eggs & ham with my son, he will be so excited!! Could you give us the rest of the recipe ? How do you use the concentrate ? Is it to marinate the fish and to decorate your plate ? What about your cawliflower purée ? The soy concentrate is just for drizzling on fish after it's cooked. You don't want to marinade in this. It's too sweet and sticky and will make cooking very difficult. For cauliflower: cut into big wedges, drizzle with olive oil, salt and pepper. Roast in 400F oven until brown (about 20 min), flip, roast the other side till brown (about 10 min). Add cream and puree until smooth. I use a Vitamix blender for a perfectly smooth consistency. It would be too thick for a regular blender, so I suggest a food processor and strain through a fine mesh strainer. Oh, just remembered, sometimes I cook 1-2 peeled, halved garlic cloves in the cream on low heat until garlic is tender and then use that garlic and cream to puree with the cauliflower.